The US occupation of Syria is only one part of a much larger, decades-long campaign of achieving, maintaining, and expanding US hegemony across North Africa, the Middle East, and Central Asia – as well as the ultimate goal of encircling and containing both Russia and China. A genuine withdrawal from the Syrian conflict would signal a seismic shift in US foreign policy and mark an irreversible decline in American hegemony. It is difficult to believe such a seismic shift could happen, and so suddenly. It is also a shift not founded in US foreign policy or fact. US troops can re-enter theater along the better formed and protected front Turkey seeks to create. The above possibilities are drawn not from speculation, but from multiple US policy papers spanning decades. US policymakers have drawn up plans for years regarding US primacy in the Middle East. In the 2009 policy paper published by corporate-financier funded think tank – the Brookings Institution – the use of US proxies like Israel to carry out major attacks on Iran were given its own chapter. However, the only obstruction to this option was the necessity of Israeli warplanes to fly over either US-ally Jordan or US-occupied Iraq. An Israeli air campaign against Iran would have a number of very important differences from an American campaign. 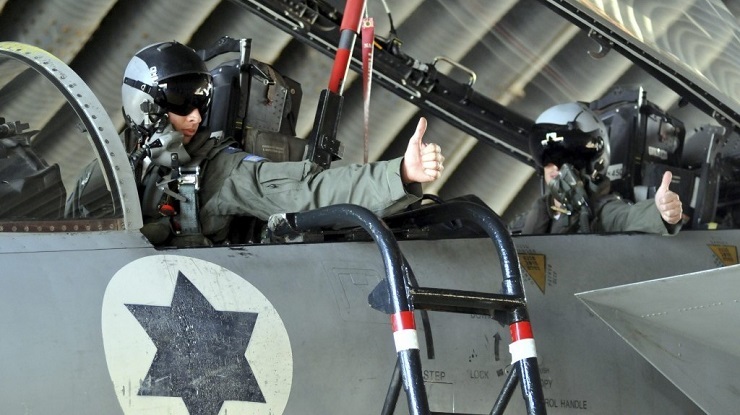 First, the Israeli Air Force (IAF) has the problem of overflight transit from Israel to Iran. Israel has no aircraft carriers, so its planes must take off from Israeli air bases. It also does not possess long-range bombers like the B-1 or B-2, or huge fleets of refueling tankers, all of which means that unlike the United States, Israel cannot avoid flying through someone’s air space. The most direct route from Israel to Iran’s Natanz facility is roughly 1,750 kilometers across Jordan and Iraq. As the occupying power in Iraq, the United States is responsible for defending Iraqi airspace. From the American perspective, this negates the whole point of the option—distancing the United States from culpability—and it could jeopardize American efforts in Iraq, thus making it a possible nonstarter for Washington. Finally, Israeli violation of Jordanian airspace would likely create political problems for King Abdullah of Jordan, one of America’s (and Israel’s) closest Arab friends in the region. Thus it is exceedingly unlikely that the United States would allow Israel to overfly Iraq, and because of the problems it would create for Washington and Amman, it is unlikely that Israel would try to fly over Jordan. An Israeli attack on Iran would directly affect key American strategic interests. If Israel were to overfly Iraq, both the Iranians and the vast majority of people around the world would see the strike as abetted, if not authorized, by the United States. Even if Israel were to use another route, many Iranians would still see the attack as American supported or even American orchestrated. After all, the aircraft in any strike would be American produced, supplied, and funded F-15s and F-16s, and much of the ordnance would be American made. In fact, $3 billion dollars in U.S. assistance annually sustains the IDF’s conventional superiority in the region. Thus, by removing US troops from Iraq regarding 2009 US plans to have Israel strike Iran then – or to have US troops withdrawn from Syria to distance the US from culpability ahead of Israeli strikes in the near future – the US can remove this critical obstruction toward greater escalation and even major war – not toward peace. However, as noted in the previous chapter, the airstrikes themselves are really just the start of this policy. Again, the Iranians would doubtless rebuild their nuclear sites. They would probably retaliate against Israel, and they might retaliate against the United States, too (which might create a pretext for American airstrikes or even an invasion). And it seems unlikely that they would cease their support for violent extremist groups or efforts to overturn the regional status quo in the aftermath of Israeli airstrikes. Their opposition to an Arab-Israeli peace treaty would likely be redoubled. Hence the United States would still need a strategy to handle Iran after completion of the Israeli airstrikes, and this could mean a much longer time frame to achieve all of America’s goals. This policy within a Syrian context could mean major, unprecedented Israeli strikes on Syrian targets – a major escalation from previous and more limited strikes – but avoiding Russian targets, under the assumption Moscow will fall short of retaliating to avoid full-scale war. Israel has already made its intentions clear that it will continue confronting “Iran” in Syria after the withdrawal of US forces. Any retaliation by Damascus – real or staged – will be used to bring the US back into the conflict with a wider claimed pretext to take on Damascus directly – with the added benefit of not having US troops on the ground serving as easy targets in the immediate fallout of a much larger conflict. There is also Turkey to consider – a nation that has played a central role in facilitating the proxy war against Syria since it began in 2011. US policymakers have included Turkey in tandem with Israel as two coordinating pressure points against Damascus for decades. Regarding events on the ground now – Turkey is already signaling its intentions to enter Syria east of the Euphrates and expand its military occupation across more Syrian territory. Turkish forces entering into Syria would serve as a front against Syrian forces in the outbreak of wider war with supply lines protected all the way to the Turkish border and deep into Turkish territory. US forces re-entering the theater can do so from Turkey and avoid being cut off in US bases currently scattered across eastern Syria. Whether or not Russia and Iran have created a sufficient amount of incentives and deterrents to place between Turkey and its continued role in destabilizing Syria since then remains to be seen. Only Moscow, Tehran, and Damascus can know what deals they have with Ankara and where its apparent plans to enter Syrian territory fit into them. US involvement in Syria was always aimed at eventually undermining, encircling, containing, and eventually overthrowing first Iran, then closing around Russia further. Unless we are to believe the US has abandoned its wider hegemonic ambitions – and there is no evidence to suggest that it has – it is irrational and ill-advised to believe the US is truly walking away from Syria without plans to dangerously escalate the conflict while minimizing its own culpability. The United States has gone from an uncontested global superpower at the end of the Cold War, to an increasing dangerous, desperate fading hegemon today. The weaker it appears, the more unpredictable and dangerous its actions are becoming. A genuine withdrawal from Syria would neither fit America’s current global ambitions, nor fit its recent pattern of increasingly dangerous and desperate policies implemented from Eastern Europe to the Middle East and North Africa, into Central Asia, and across East Asia. A skeptical public leaves no room for the US to capitalize on the apparent “good will” the US is trying to cultivate through its supposed withdrawal from Syria ahead of provocations by proxy it will have fully underwritten and will immediately move to exploit toward greater war.